Gigantabugs - Schaefer Advertising Co. When the Fort Worth Zoo tells you they’ve got something big coming, you naturally go think elephant, giraffe, hippo – that kind of thing. Not even close. This time it was bugs. Enormous, animatronic bugs that moved, flapped, hissed and even sprayed. Thirteen of them would be located throughout the park to greet visitors who thought the lions and snakes would be the scariest animals they were going to see that day. Schaefer was tasked with creating a name, identity and marketing materials for the exhibit. Most of us were fine with it. 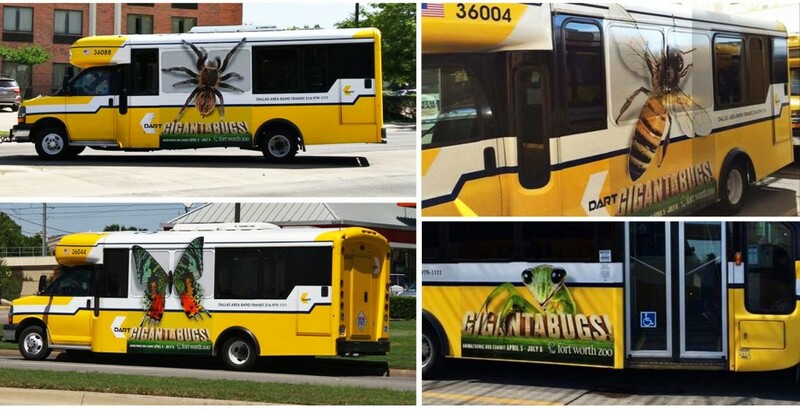 Certain people were less than enthused to learn of the existence of a car-sized spider in Fort Worth – even if it was a robot. For the name of the exhibit, we went with GIGANTABUGS!, which was fun and playful but still conveyed exactly what people were in for. 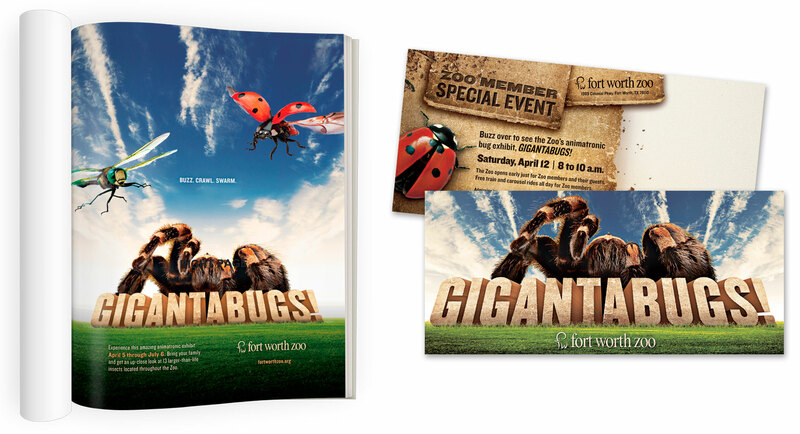 And since these bugs were larger than life, our marketing materials had to be “GIGANTA,” too. 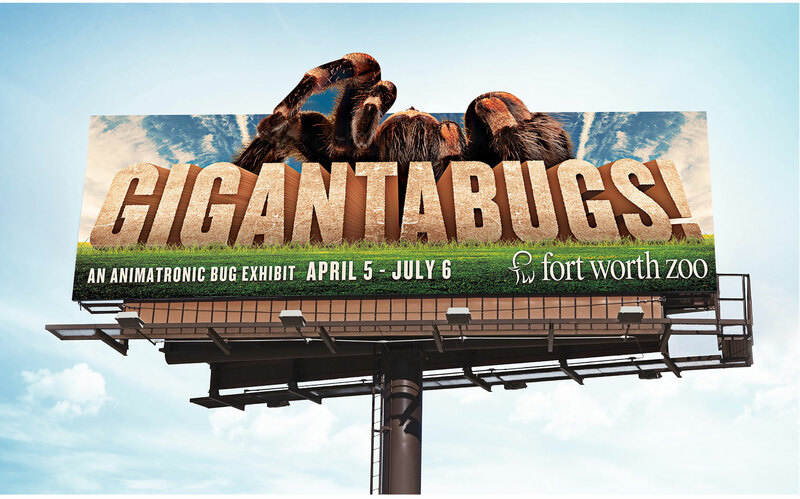 Our TV spot featured a variety of enormous bug shadows invading well-known Fort Worth spots. 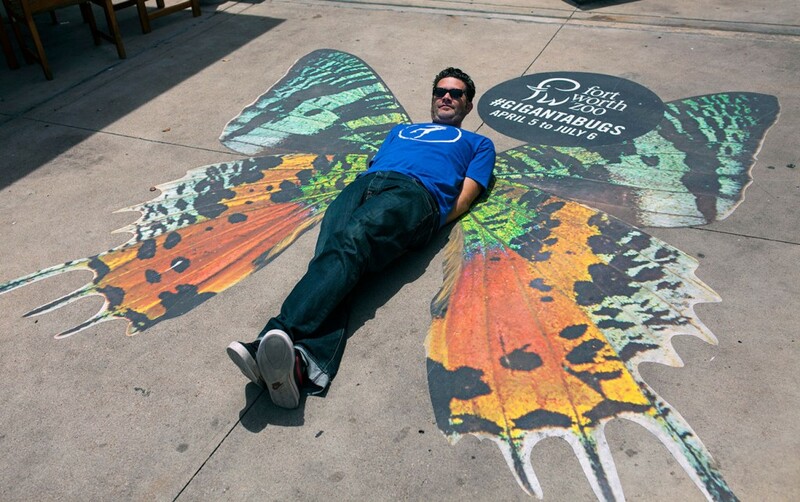 To further tease the exhibit, we applied ten-foot bug decals to a three-story building and the sidewalk in front of a busy grocery store. 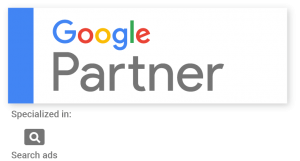 This wouldn’t be a case study if our marketing didn’t work, so you probably saw this coming. Our TV spot and guerilla efforts received positive feedback and a lot of social shares leading up to the exhibit. And during the months the exhibit was open, Zoo attendance surpassed their goals by 5%.